​FRISCO – Investor Sam Moon Group plans to build a boutique hotel in the Legacy West Urban Village on Headquarters Dr. at Communications Pkwy. The planned hotel will be across the street from Liberty Mutual Insurance's huge new corporate campus at Legacy West. JP Morgan Chase's campus is in the next block. "The new hotel will be a 12-story, 170-room Marriott Autograph Collection Hotel," said Legacy West developer Fehmi Karahan. 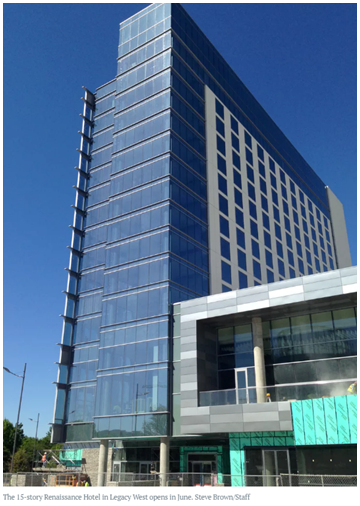 Sam Moon Group is also wrapping up construction on a 15-story, 300-room Renaissance Hotel at the south end of Legacy West Urban Village on Legacy Dr. The new Renaissance Hotel and the surrounding retail and restaurant complex are scheduled to open June 2017.